The Spring Festival travel rush has begun, with the first round of train tickets going on sale today (January 3). The China Railway Corporation announced this week that sales for CNY tickets through its official website (www.12306.cn) and the 12306 app would start today. You can also now pay for tickets via WeChat and check up on the status of your train by connecting your WeChat account to the 12306 ticketing website (available only in Chinese for now). If you're looking to book tickets in English, Trip (previously known as 'Ctrip') has you covered. Train tickets are able to be purchased up to 30 days in advance, with new tickets being released daily during specific timeslots. That means sales for February 1 trips are available for purchase on January 3, while tickets for February 2 can be purchased starting from January 4 (and so on). In Shanghai, bookings can also be made from agencies around the city and at train station ticket windows starting from Friday, January 5. Tickets sell out fast, though, so if you're looking to book, we'd recommend doing it as early as possible. That means making sure your trip is ready to be booked from your platform of choice as soon as tickets are released for your travel date of choice. 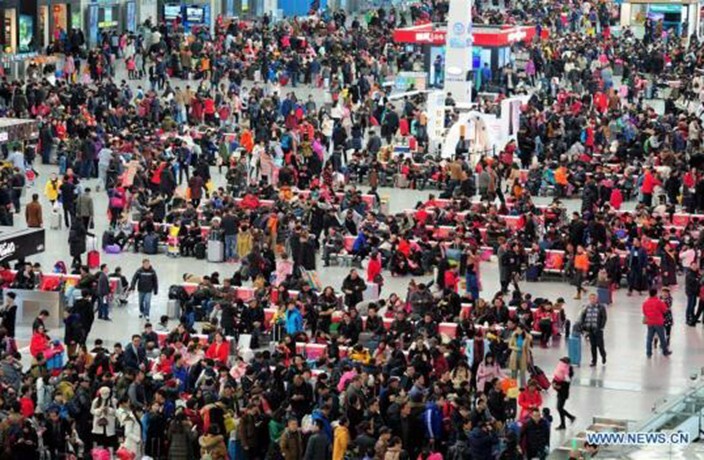 The (in)famous Chunyun period (春運), which is the largest annual migration of humans on Earth, typically starts a fortnight before New Year's Eve and lasts forty days and nights. Up to 357 million rail journeys were made during Chunyun 2017. The 2018 Chunyun period will start on February 1 and last until March 12. Chinese New Year falls on February 16 this year. FangSuo Commune Guangzhou opened in 2011 and is a mainstay for Guangzhou’s centrally located Taikoo Hui.